The Rangitīkei District Council received 974 responses from residents over whether they wanted a kerbside collection recycling system – like the one in action in Palmerston North. Instead of needlessly dumping a whole lot of material, Rangitīkei towns could soon bring in kerbside recycling. Officials are considering introducing a fortnightly kerbside recycling and weekly rubbish collection service in Bulls, Marton, Hunterville, Mangaweka and Taihape. Currently, urban rubbish is only collected via commercial arrangements between residents and waste management companies, without any council involvement. 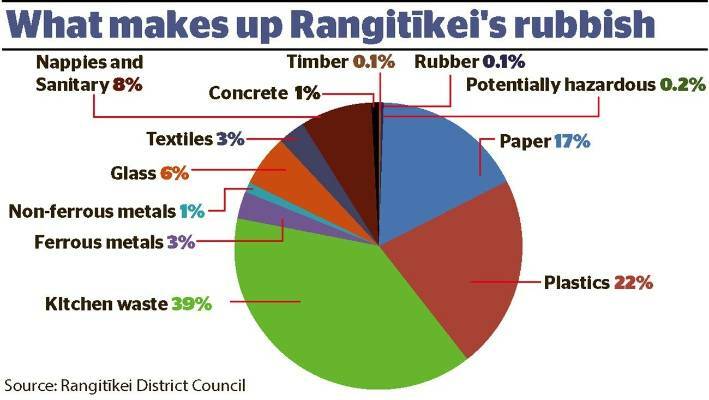 The Rangitīkei District Council last year conducted a study that revealed more than 75 per cent of rubbish going to landfill in the district could be recycled, prompting officials to urge residents to create compost heaps, worm farms and use recycling centres. It showed 39 per cent of the district’s rubbish going to landfill was organic kitchen waste, 22 per cent was plastic and 17 per cent paper. The council is asking for quotes from waste companies to determine the cost of a more environmentally friendly approach. The council received 974 responses after asking the community whether they wanted a recycling system injected into their rates – 541 agreed and 433 wanted the status quo. Although responses from Hunterville and Mangaweka were mixed, and not decisive for either option, the trucks would likely pass through the two towns on the way to Taihape, so including them made sense, customer services and communications team leader Carol Downs said. The council last year revealed more than 75 per cent of its rubbish going to landfill could be recycled. Councillor Angus Gordon said it cost ratepayers about the same to have rubbish bags as it would to implement the recycling system. Just as the council is forced to treat sewage for the good of the environment, it should also separate rubbish from recycling. “Splitting up the waste stream into recyclables and non-recyclables is the right thing to do. For example, it was unrealistic for families on restricted incomes and elderly members who didn’t drive to use transfer stations. A final decision would be made once indicative costs have been sought.